ONE of the most successful examples of “ship surgery” was the salvaging of the White Star liner Suevic. The cost of the work was more than justified, for the vessel is still leading an active existence. She was built by Harland and Wolff of Belfast in 1900, and was the last of a class of five begun in 1898. These ships were designed for the Australian service of the White Star Line. The Suevic was a fine-looking ship of the design then popular: four masts and a single funnel. On her length of 550 ft 2 in and beam of 63 ft 3 in. She had a gross tonnage of 12,500. Her quadruple expansion engines gave her a speed of thirteen knots on a moderate coal consumption. She was designed to run to Australia by way of the Cape of Good Hope. A magnificent cargo carrier with a deadweight capacity of 15,435 tons, she also had accomm-odation for 350 passengers in one class. THE SUEVIC ON THE ROCKS. The upper photograph shows the liner on the rocks near the Lizard, Cornwall, where she struck on March 17 1907. Her bow as firmly held by the rocks, and in a few days the lower parts of it were reduced to a tangle of steelwork. It was decided to cut the ship in two, abandon the bow and salvage the remaining 400 feet of the vessel. This after section was perfectly sound and later was fitted with a new bow. 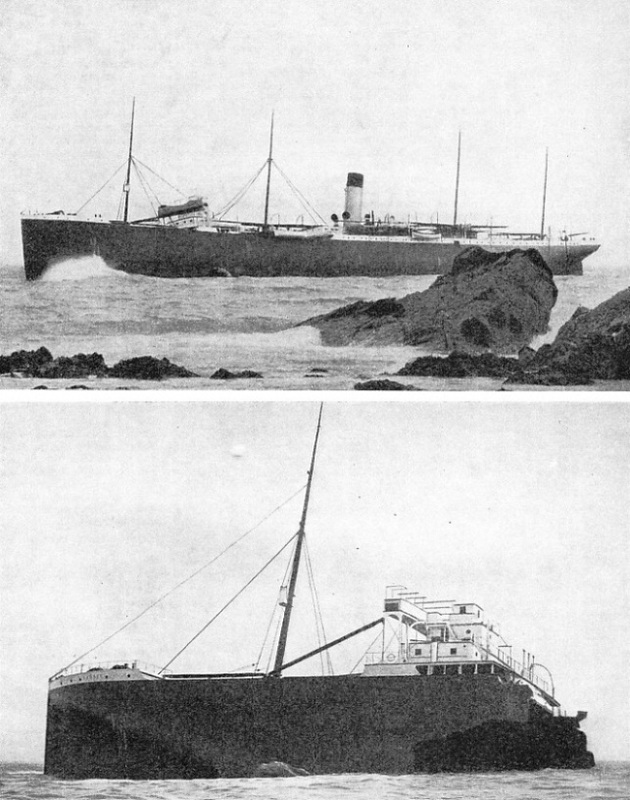 The lower picture shows the damaged bow shortly before it was broken up by the sea. When she was ready for service the Transvaal War was in progress; when her maiden voyage was advertised the Admiralty suddenly requisitioned her as a transport, so that her first trip was to the Cape with a few details and military stores, and then on to Australia with time-expired troops. After that she was released to her owners and, with her four consorts, maintained the regular monthly Australian service. This service was extraordinarily popular; its accommodation gave the settler of good standing the opportunity of travelling comfortably to Australia at a reasonable rate. The White Star Australian service developed on the passenger side a character of its own. The large cargo capacity of the ship was fully used, especially homeward bound. In March, 1907, the Suevic was homeward bound from Melbourne and had already called at Cape Town and Tenerife, one of the Canary Islands. She was due to call at Plymouth to land the bulk of her passengers before going on to London to discharge and then round the coast to Liverpool, her home and port of sailing. On March 17 she was making her landfall. A heavy blow from the southward and westward, raising a high following sea, had moderated and there was a gentle westerly breeze. Visibility was good but fog threatened. There was no difficulty in getting observations, which gave the Lizard Light 138 miles away. The ship followed her course at full speed of thirteen knots. At ten o’clock in the evening dead reckoning gave her as having covered 122 miles of the 138 without making allowance for the set of the tide, so that she should have been well within the range of a light as powerful as the Lizard. By that time the night was dark and thick, with showers of drizzling rain. The Suevic carried straight on. At a quarter-past ten the glare of the light was seen ahead through the murk. The ship’s course was confirmed, but the light seemed to be so low down that the captain considered he was several miles away from it and carried on without using his lead. No allowance was made for the fact that the cause of the light’s lowness might have been, as it was, that the fog over the lighthouse was throwing the beam down on the horizon. The captain wanted to get a four-point bearing to a degree before he altered course for the Eddystone Lighthouse and Plymouth. That was cautious and good policy, but the lead should have been used as an additional precaution, for the depth of water would have told him at once he was much nearer in than he imagined. He was far too experienced a seaman to rely on the fog signal of the Lizard Lighthouse. Although this was powerful and of the latest pattern, all fog signals relying on sound are handicapped by the extraordinary and still unexplained “zones of silence” ” that cause them to be inaudible in certain places, although perfectly clear and distinct farther out. THE STERN OF THE SUEVIC being towed into Southampton Docks. The salvaged part of the ship included the engines, boilers and the bulk of the passenger accommodation. It was a difficult undertaking to cut the vessel in two, for in 1907 the use of the oxy-acetylene flame was unknown. The only way of doing the work was to use dynamite and to explode a large number of small charges. At twenty-five minutes past ten the chief engineer, standing on deck, saw the loom of the light and, crossing over to get a better view, saw rocks breaking the surface close to the port side of the ship. Without delay he hurried below to his engines, where the officer on watch was standing by the controls. At the same time the man on look-out in the crow’s nest on the foremast reported breakers straight ahead and the lighthouse high up. There was no doubt they were close inshore and heading straight for disaster. The master immediately ordered the helm hard a-port, but it was too late. The Suevic had hardly swung two points before she struck the rocks. The engines were at once put over to full speed astern in an attempt to haul her off; but, although they exerted their full power, they could not move her an inch. To prevent doing more harm by dragging the bottom of the ship over the rocks, the engines were stopped and distress signals were sent up. These were seen at once from the shore. The news that a big passenger liner was wrecked on the dreaded Maenheere Rocks spread rapidly. With little delay all the Royal National Lifeboat Institution lifeboats within reach went to the Suevic to assist. Passengers, were ferried ashore in the lifeboats and in the Suevic’s own boats, which were swung out and manned in perfect order. Steam tugs arrived soon afterwards and helped in the work. Most of the passengers were landed with the minimum of discomfort at the little village of Cadgwith. The Great Western Railway organized a fleet of motor-cars to take them to Helston, the nearest railway station, where the single line was kept open all night. Nowadays the movement of a number of passengers by road with the minimum of delay is an every-day road transport job, but in 1907 it was unheard of, and the railway company received great credit for their prompt action. In the meantime, the luggage was landed by tug and sent on after the passengers. available, the steam reciprocating engine is probably the best in an emergency, because it is most easily and most surely rever-sible. Orders from the bridge would be carried out with a minimum of delay, and the whole engine-room staff would be on watch in their appointed places at telegraph pump controls. In the boiler rooms, officers of the watch would be carefully observing the steam gauges to see that plenty of pressure was available for any purpose. If such an accident should happen to-day, therefore, few improvements in machinery could assist in more rapid manoeuvring. A modern ship would have an advantage over the Suevic in 1907 in certain navigational devices. She would be fitted with an echo sounder, for instance. This is a device with a quickly flicking light which gives the depth of water under the keel at any particular moment. In another form it traces out on a revolving roll of paper the exact contour of the sea bottom. The later vessel would also have submarine signalling apparatus, although this is not of such great advantage on an iron-bound coast. Radio direction-finders also would pick up audible signals from shore beacons and would probably enable the ship to fix her position more accurately. This would undoubtedly have assisted in the navigation of the Suevic. READY FOR THE NEW BOW. As soon as the stern of the Suevic was salvaged a new bow was ordered from Harland and Wolff, who had built the ship. The new bow was 212 feet long and extended to the after end of No. 3 hold, thus giving a slight overlap on the salvaged portion. 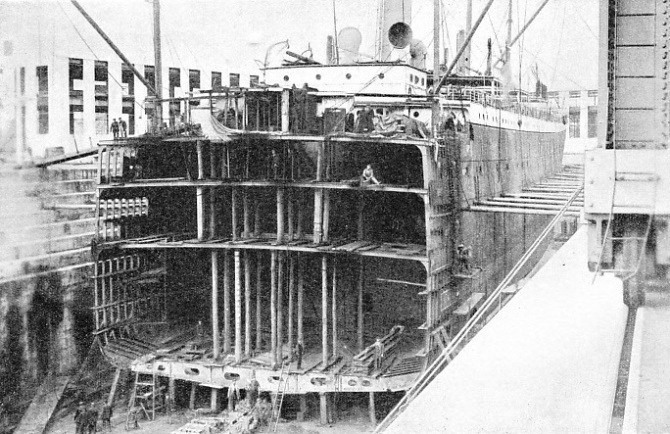 The photograph shows the stern of the ship in dry dock at Southampton, where it was waiting for the arrival of the new bow. The news of the disaster caused much excitement in Lloyd’s, as another passenger liner was wrecked on the same night. The White Star Company insured its own ships, but the underwriters were interested in her cargo, for it included butter, wool, wheat, frozen meat, rabbit skins, copper and other Australian commodities, valued at a high figure. The salvage steamers Ranger and Linnet, former Navy sloops, were sent down from Liverpool, equipped for the work, and every available barge and coaster in the West Country was collected to receive the cargo. Holds Nos. 1, 2 and 3 were by then open to the sea, but the engine room and boiler room, and the holds abaft them, were still tight and dry. By March 20 the sea had subsided sufficiently for the lighters and coasters to go alongside, and the ship was lucky to be able to have the full use of her own steam. The work proceeded rapidly and a close watch was kept on the weather; for as soon as the Atlantic rollers came in work had to be suspended. Happily, calms continued until the 27th, by which time all the sound cargo had been saved. Cargo to the value of about £40,000 was discharged every day, and the work was completed only an hour before the weather changed. A heavy swell set in, making it impossible for small craft to work alongside, and a dense fog nearly caused the wreck to be rammed by a passing vessel. The next thing to be decided was what to do with the hull. It was obvious that the forward part was firmly held by the rocks and would defy all efforts to release it. In addition, the hull was like a sieve, for the swell, lifting the stern and letting it fall, had ground all the lower part of the bows into a tangled mass of steelwork. There were many who thought it was wisest to cut the losses and abandon the ship, but the men on the spot did not agree. Their plan was to cut the ship in two, as had been done a short time before with the Elder Dempster steamer Milwaukee. It was a daring resolution for many reasons. The conditions surrounding the Suevic were much more difficult than those of the Milwaukee. The weather might at any time ruin all efforts. Operations on the Elder Dempster ship, too, although successful technically, had been a financial failure. A thorough examination of the wreck of the Suevic determined the salvage men to take the risk. The last compartment damaged was the coal cross-bunker forward of the boiler room; for 400 feet of her length the ship was sound, including the engines and boilers and practically all the passenger accommodation. These were the most valuable parts of the ship. The undertaking would present no great difficulty now, but at that time the use of the oxy-acetylene flame was unknown. The only way to do the work was to cut through the whole ship, including the main strength deck and the double bottom, with dynamite. That was an exacting proposition, for it was obvious that charges of considerable power could not safely be used; all the work had to be done with numerous small charges planned to explode at just the right moment and to exert force in exactly the right direction. Most minute calculation was called for. The big ship was neatly cut in two just abaft the bridge, which in the Suevic, as in many Harland and Wolff vessels, was isolated from the passenger accommodation to give the officers as quiet a time as possible during their watch below. The swell, lifting the buoyant stern, finally helped to break the vessel in two, and the after part floated off on an even keel. The attendant tugs took hold at once and got the ship clear of the reefs; but their job was more to help in the steering than in the propulsion, for the engines and boilers were in full commission. The Suevic steamed stern foremost to spare any strain on the exposed bulkhead, which had naturally been weakened by the numerous explosions close to it. She made her way to Southampton where she was docked. THE NEW BOW OF THE SUEVIC leaving Belfast on October 19, 1907, for Southampton. It was built on a slipway in the ordinary manner, but was launched head foremost. This unusual procedure was necessary as the bulkhead that closed the after end was not built to withstand a great pressure of water. The bow was towed by the tug Pathfinder, which is seen in the photograph, and steered by the Blazer. The journey from Belfast to Southampton took six days. 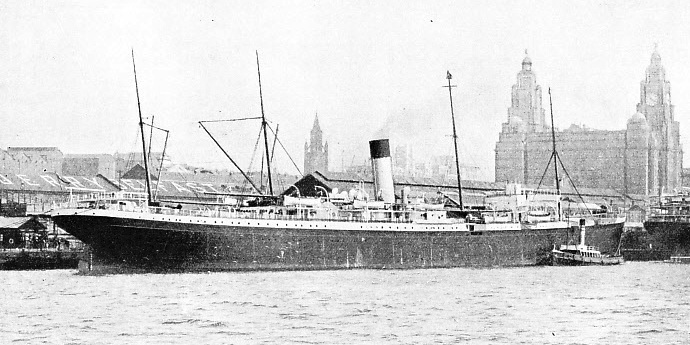 As soon as the stern was salved, the White Star Line gave orders for a new bow to be built at Harland and Wolff’s yard at Belfast, where they had the plans of the original ship. It was designed to be 212 feet long, extending to the after end of No. 3 hold to give a slight overlap on the salved portion. The bow was built on a slipway in the ordinary manner and launched head foremost. This was an unusual procedure in a British shipyard, but it was deemed safest, as the bulkhead closing the after end was not designed to withstand a big pressure of water. Bridge, boats and other details were attended to, and the bulkhead was strengthened. It was towed to Southampton bulkhead foremost by the tugs Blazer and Pathfinder. A special donkey boiler was installed, with powerful pumps to deal with possible leaks. These pumps were not used, although some bad weather was encountered in the Irish Sea. The bow left Belfast on October 19, 1907, and arrived at Southampton on the 25th, towed by the Pathfinder and steered by the Blazer. 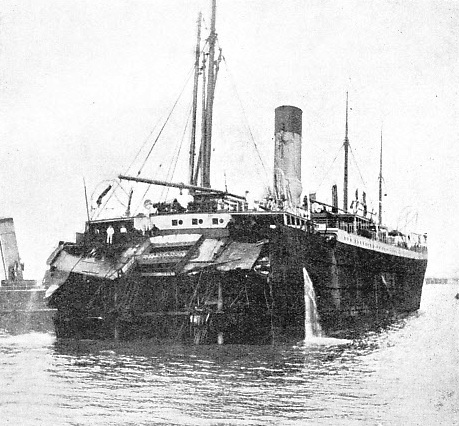 A similar job of ship surgery was carried out on another occasion by Harland & Wolff at their Belfast yard, when the Royal mail liner Lochmona ran aground near the entrance to the Mersey and broke in two. Here again a new fore end was built and the technique which had been evolved at the time of the construction of the Suevic was again brought into action. The problem of building a new fore end is fairly simple provided that plans of the ship’s lines exist. It is much more difficult to launch a new bow and take it to its destination. It is necessary to launch the fore portion of the hull bow first. A bow naturally runs farther into the water than does a complete ship when launched stern on. The question of trim and stability is difficult, too, when dealing with an incomplete ship. Furthermore, the bulkhead which forms the “aft end” of this portion of the hull must be specially strengthened, and this factor may involve the completed structure in a certain amount of stress. Shipbuilders are notoriously versatile, however, and there are not many problems of this nature which cannot be satisfactorily solved. When the Suevic’s new bow arrived at Southampton, the two sections were dry-docked and drawn together. The shipbuilders’ work was found to be exact to the smallest detail. So confident were the directors of the White Star Company that they advertised the next sailing of the Suevic for January 14, 1908, while the new bow was still on the stocks at. Harland and Wolff’s yard, Belfast. The ship thus salved and reconstructed was as good as ever she had been, and proved it. Between her salvage and the war of 1914-18 she ran regularly on her normal service to Australia. Before the end of 1914 she was commissioned as a trooper and was on service for four years eight months and eighteen days. During that time she steamed 241,788 miles, visited forty-two different ports and carried 17,566 troops and nearly 1,500 horses. She was worked as hard as possible. In 1920 she returned to the Australian service and continued on it until 1928, when she was sold. Most of her sister ships had already gone to the scrappers, but her buyers, who gave £35,000 for her, had no intention of letting her end her days. She was converted into a pelagic-whaling mother-ship for service in the Antarctic. Such work would severely try a new ship of good construction, but the Suevic, under her new name, the Skytteven, has proved that after years on the Australian route, and after strenuous years of war service, she can carry out, as efficiently as a new ship, the arduous duties of a whaling mothership in the Antarctic. Although the “surgery” on the Suevic would not, in these days, present so many intricate problems - especially as the oxy-acetylene flame is now used - the reconstruction work on her remains an outstanding feat of salvage. IN SERVICE AGAIN. The reconditioned Suevic lying at the Liverpool Landing Stage in August, 1925, after she had been in regular service on the run to Australia. During the war of 1914-1918 she was commissioned as a troopship. She served for nearly five years and carried 17,566 troops and nearly 1,500 horses. In 1928 she was re-named Skytteven and converted into a whaling mother-ship for service in the Antarctic. You can read more on “Dramas of Salvage”, “The Shipbreaking Industry” and “The Ship That Broker Her Back” on this website.